For Jon and Kirsty, who had been to Glastonbury 23 times between them there could be only one theme. 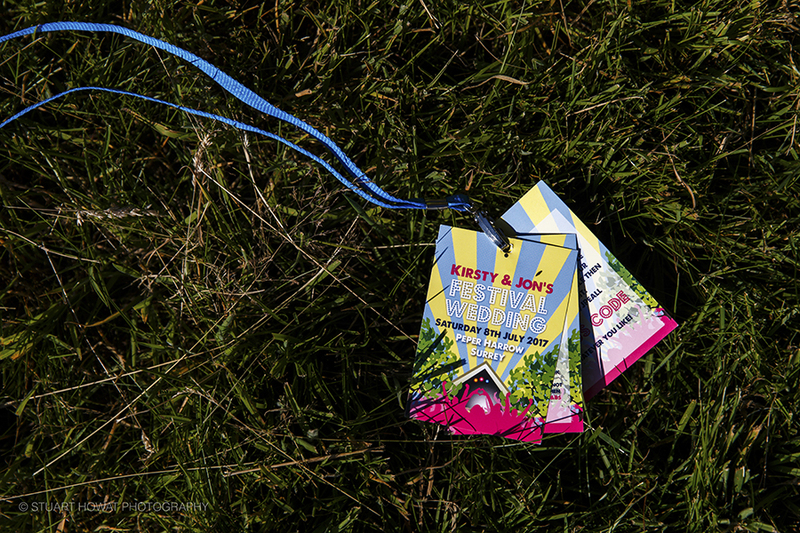 Their Glasto theme ran through the invitations, stationery, the epic cake and flowers. There was only one touch missing really and for that I think everyone was grateful, the mud! 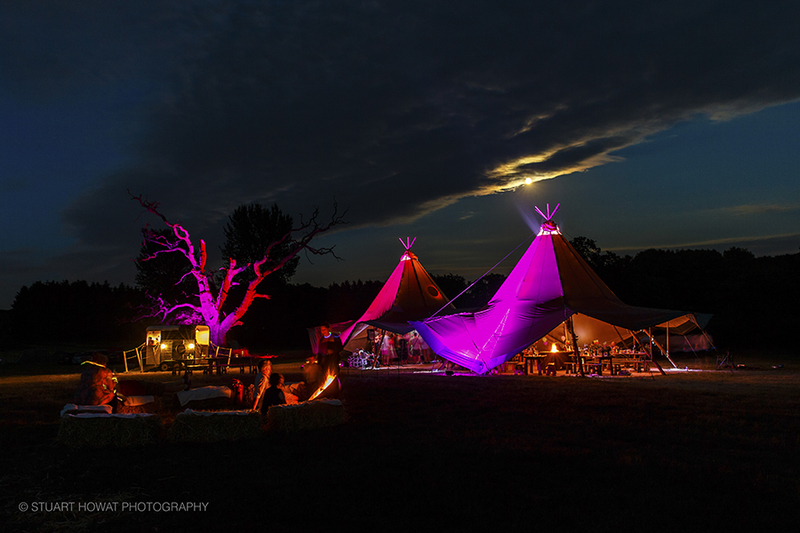 Kirsty and Jon are super busy with their jobs so they asked us to build a package for them to include tipis, caterer and bar, along with our standard package of loos, generator, security and on the day coordination. They were certain they wanted tipis so we looked at the details of three different suppliers for them. Stunning Tents were the choice with one giant hat and one kungsornen to accommodate their 65 day guests. On caterers we investigated various informal street food options; big pan, Mexican and British before arriving at Pie and Mash. 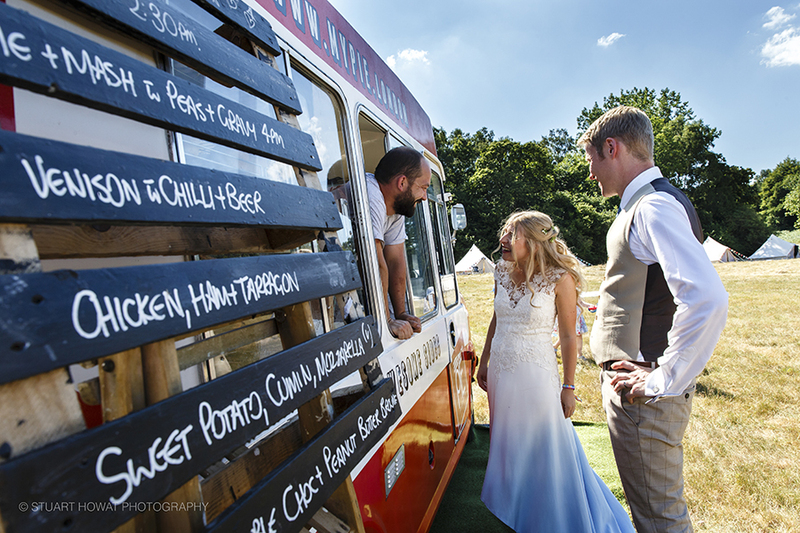 Chris from My Pie would provide canapés, mains, dessert and evening food from his food van. (More on the menu later). To complete the package, Tipsy Goose would be providing the bar from their funky converted horsebox. With tailor-made cocktails for welcome drinks, providing the wine and fizz for the meal and a pay bar in the evening. Although couples are often keen to supply their own alcohol it can require some extra thought about how drinks will be kept cool, what will they be served in and from, who will collect the empties etc. It almost definitely will end with overbuying as you of course don’t want to run out. Sometime the cost of a mobile bar can be well worth the money to take the stress and logistics out of your hands. There are bars that are available dry hire to stock and serve your alcohol. For pay bars some will charge minimal hire fee in return for the bar takings and often the deposit amount will be returned if a minimum fee is reached. When it comes to the converted vehicles/horse boxes these are often charged a little more for, but what you are gaining is a bit of theatre and something that will add to the theme or vibe of your day. So fast forward to 6th July and it’s tipi set up day. Demonstrating their love of gigs Kirsty and Jon left tipi set up to us while they had their legal ceremony, lunch with family and went to see Kings of Leon. We face-timed from the field to show the set up and agree how many sides to leave. Early July if you remember was a scorcher, so we lifted maximum sides on the dining side of the tent to allow as much breeze as possible. Stunning Tents also helped set up the hops on the horizontal poles which looked really effective. 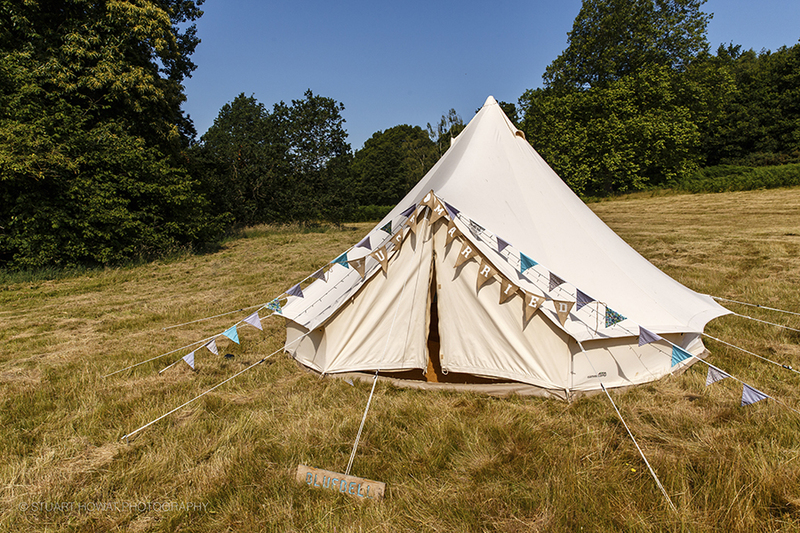 Meanwhile, Beautiful Bells were busy setting up a run of 8 bell tents down one side of the field. Friday was a day for family and friends to help dress the tipis and transport everything to site. Kirsty and Jon had gone to quite a bit of effort to provide outdoor games for their guests, young and old. The giant kerplunk was particularly impressive! For the tables, Kirsty and Jon were going rustic and leaving the solid wood tables naked. 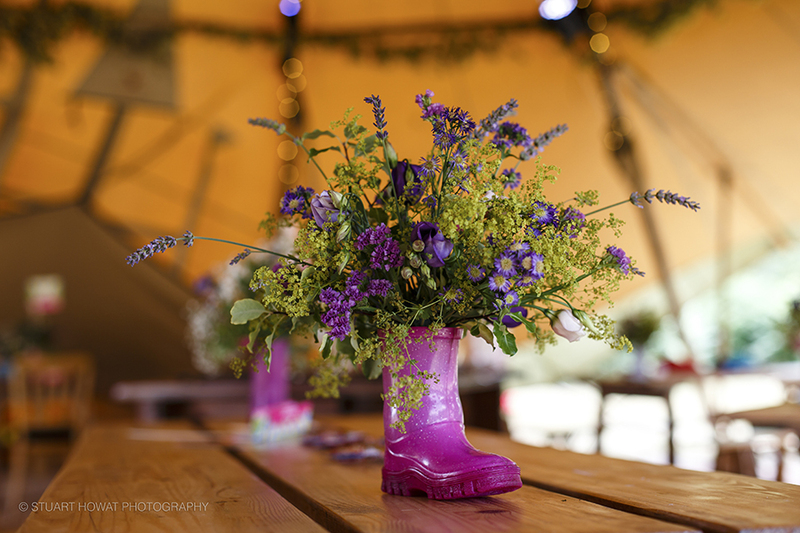 Jon’s Mum had created super cute wellie boot flower displays as centrepieces and table names, table plan and name cards were all in Jon and Kirsty’s Glasto theme, to compliment the lanyard invitations that guests had received. Wedding day arrived and we were on site at 9am along with Jon. Hay bales for the ceremony were delivered so we set those up, placing the bale covers on them. A few finishing touches in the tipi and Jon left to get ready. We met My Pie and Tipsy Goose to get them set up and we were pretty much ready to go. We also got to enjoy Jon’s Mum setting up the most epic of all wedding cakes. So amazing! We went up to the gate when guests started to arrive to make sure all cars were parked out of camera view. Family children were in position at the front of the ceremony area to hand out Kirsty and Jon’s festival wristband which was a lovely touch. 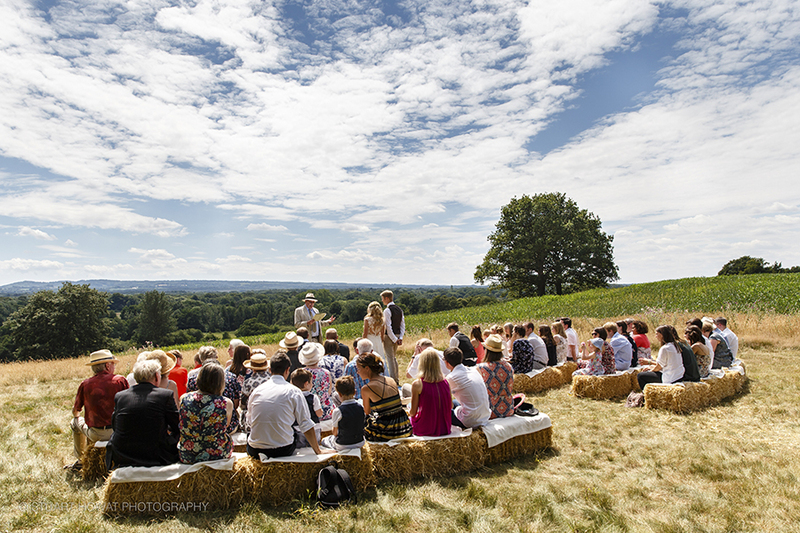 The weather couldn’t have been more perfect, as guests waited on the haybales, taking in the views. Kirsty arrived and walked down the aisle with her dad looking so beautiful in her blue ombre dress from Lucy Can’t Dance. Jon also looked very dapper in his trousers and waistcoat from Henry Herbert Tailors. For my dress, I knew I wanted something ‘different’ and so I started with a google search of unusual / unique wedding dresses, which led me to look at vintage / boho styles as well. This is how i discovered “Rock the Frock” a boutique specialising in alternative wedding dresses from a variety of up and coming designers. With my mum, sister and 1 year old nephew watching on, Rock the Frock helped me try on at least 12 potential dresses. But as soon as I tried on Lola, I knew it as the one. In subsequent visits to the shop, Lucy (who designs and makes all Lucy Can’t Dance dresses) was great at measuring and tweaking the dress until it fitted perfectly. Lucy even sent me samples of different blue dyes so we could get the dip dye perfect:. It looked like a beautiful and informal ceremony and I love this pic of a little game the guests were asked to play, answering questions with a pink heart for Kirsty or a blue one for Jon. With a humanist ceremony like this you really can make it your own. 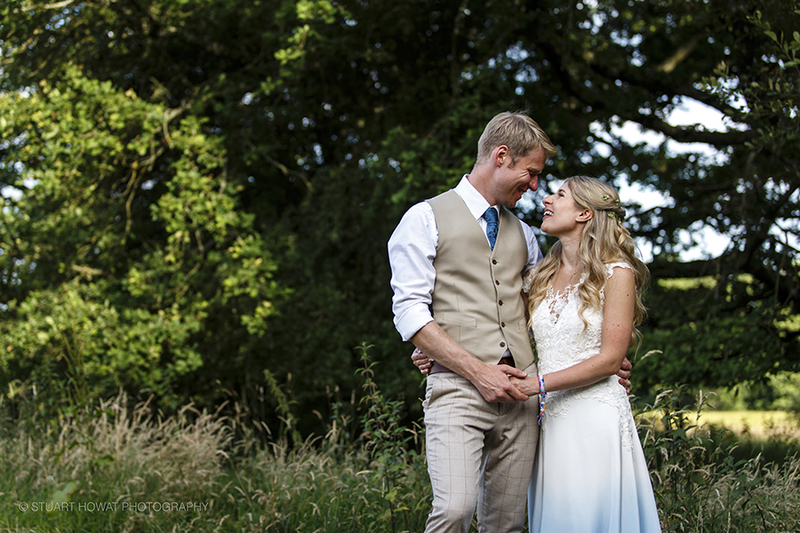 After the ceremony, guests followed Kirsty and Jon down into the valley and Tipsy Goose got busy providing guests with their welcome drinks. A choice of Negroni or Margarita cocktails or some of the local ale’s Kirsty and Jon had sourced from Langham’s Brewery. Chris was meanwhile busy plating up wooden boards of tasty canapés which included; corn fritters; sausage roll slices smoked cheddar mousse; quail scotch eggs and macacini, which we helped to distribute among the mingling guests. 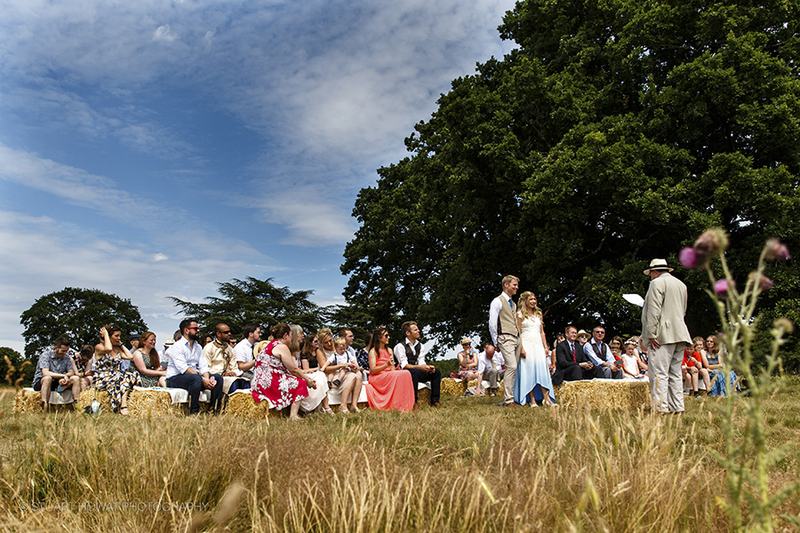 It was a glorious sunny day and some guests soaked up the sun sitting on hay bales or mingling round the horsebox. Others made their way into the tipi for a bit of shade. We had judged it right on lifting all the sides in the dining end and the breeze was perfect but did play havoc with the place cards. This is a common little problem so we would recommend your name tags being attached to or place underneath something a bit weighty to keep them in place. After an hour or so of drinks and canapés we ushered guests in and asked them to make their way up to the van table by table to collect their pie and mash. Kirsty and Jon had chosen a selection of; chicken and smoked ham with tarragon; venison, chilli and beer and sweet potato, cumin and smoked mozzarella. Yum! Dessert was chocolate brownie and ice cream which we gave Chris a helping hand to deliver to the tables to help ensure the ice cream made it to people before it was completely melted! Once tables were cleared, Tipsy Goose delivered bottles of fizz to the tables and it was speech time. Followed by cutting of the - no don’t do it - cake. The band arrived and started to get set up, while Kirsty and Jon went away for some stunning magic hour shots on their own. By the time Kirsty & Jon got back, the band were ready. They kicked off with their 1960s set and worked their way through the years from there. Before we left we lit the fire pit, cut up the cake for evening nibbles and Chris laid out platters of cheesy chips and bacon sandwiches. We left the tipi jumping and went home with a lovely satisfied feeling that everything had gone so well for such a lovely couple. We wish them a lifetime of love, laughter and happiness. I'll leave you with some kind words from Kirsty & Jon. "Nikki was great from start to finish. From showing us Hidden Valley and giving us the vision for what things could look like on the day, to coming up with some great suggestions for food and drink options, to seamlessly communicating with all our suppliers, to working effortlessly on the day (and the day before before the day) to ensure everything ran perfectly. Nikki was always available to chat or email through any questions, and overall made what undoubtedly was a feat in project management run smoothly and professionally. 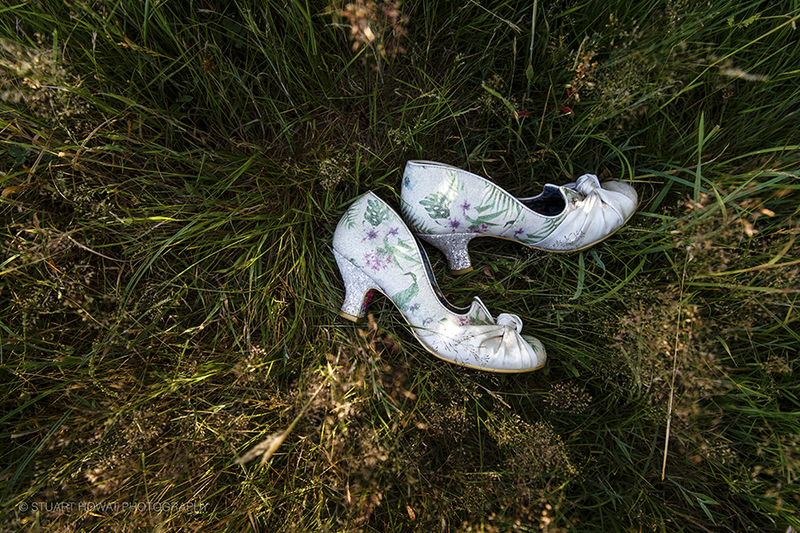 We couldn't recommend Nikki or Hidden Valley highly enough".